This is a CCK field type that will count the number of nodereferences to a particular node. The count is updated both when the node that is being counted is saved, as well as when a node that is referencing the node being counted is saved, updated or deleted. 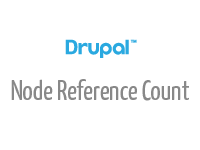 It will count references from individual nodereference fields as well as aggregate counts from multiple nodereference fields to the same node. This should be an improvement over alternate solutions to the same problem, such as: Using a computed field, which would either be updated when viewed, but not available to views, or when saved, but not when a nodereference was added or removed. Or a view, which would be updated when displayed, but with a performance price and not be available within the node itself.